The handiwork of the spiny oak sawfly (Periclista albicollis) is becoming very apparent on the developing leaves of bur and white oaks in southwest Ohio. The small, light-green semi-transparent spiny oak sawfly larvae have shiny black head capsules and are covered with rows of forked (bifurcated) spines. Early instars primarily feed on the underside of newly emerging and expanding leaves. They produce small holes that get larger as the leaves expand. 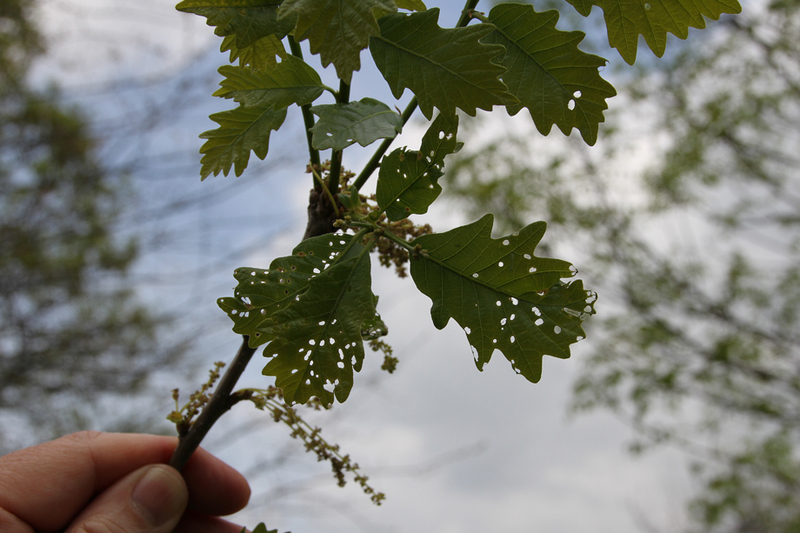 Later instars consume interveinal tissue leaving behind the main veins to give the oak leaves a tattered appearance. Look closely at holy leaves: the coloration of spiny oak sawfly larvae allow them to blend into their leaf-food background.